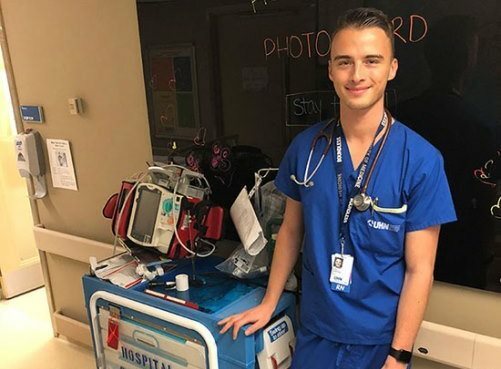 Three years into his nursing career, Alec Azaryev was looking to expand his skillset. So, when the registered nurse (RN) at Toronto General Hospital’s Cardiovascular Intensive Care Unit heard about new programs being offered at the Michener Institute of Education at UHN, he signed up. A joint venture between Practice-Based Education in Collaborative Academic Practice (CAP) and Continuing Education at Michener, the programs adopt a blended learning model – online, in-class, and clinical training – to reinforce theory-practice integration while meeting different learning needs. There’s a six-week acute care program and a 10-week critical care program. Each includes interactive modules covering all body systems and more than 200 hours of clinical practice in critical care. An additional and unique feature is a simulation component about having compassionate conversations with patients and families, which is facilitated by Michener’s simulation team. “Doing this training has been very rewarding,” says Alec, one of 16 RNs completing the program, which was launched at Michener’s St. Patrick Campus earlier this fall. Leaders from across UHN helped create the course content to ensure it’s current. “Having Canada’s only school within a hospital allows us to realize opportunities to deliver certificate-based speciality programs like critical care for a full range of professions that are co-developed by experts who are rooted in current clinical practice,” says Brenda Perkins-Meingast, Director, Practice Based Education, CAP. A UHN Patient Partner was also a member of the development team for the simulation component of the course, providing a valuable perspective to ensure the case scenarios are realistic and that patients and their family are the central focus of care. “Through this collaboration between Michener and CAP portfolios, UHN will be better positioned to tailor these courses to the desired needs of our staff, while bridging education and practice through a curriculum that is responsive and immersive,” says Mohammad Salhia, Director, Continuing Education at Michener.